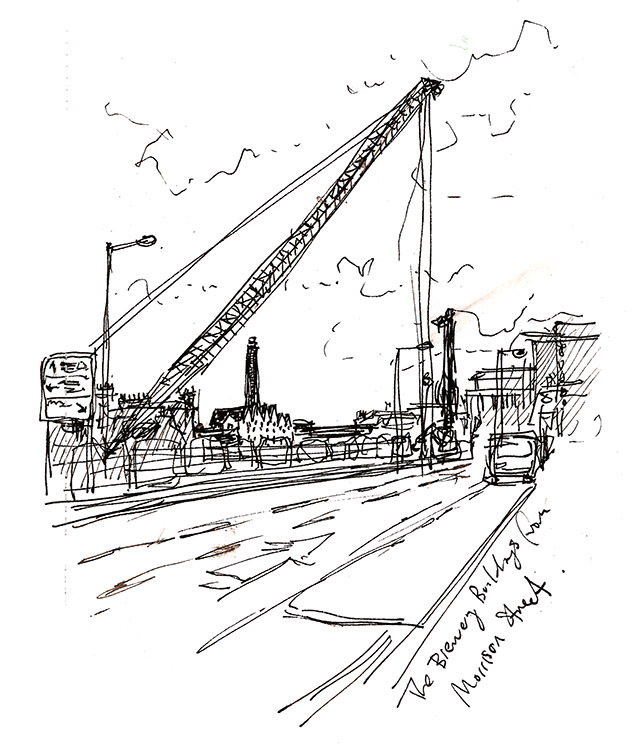 Drawing in the great outdoors in Edinburgh city centre this January. 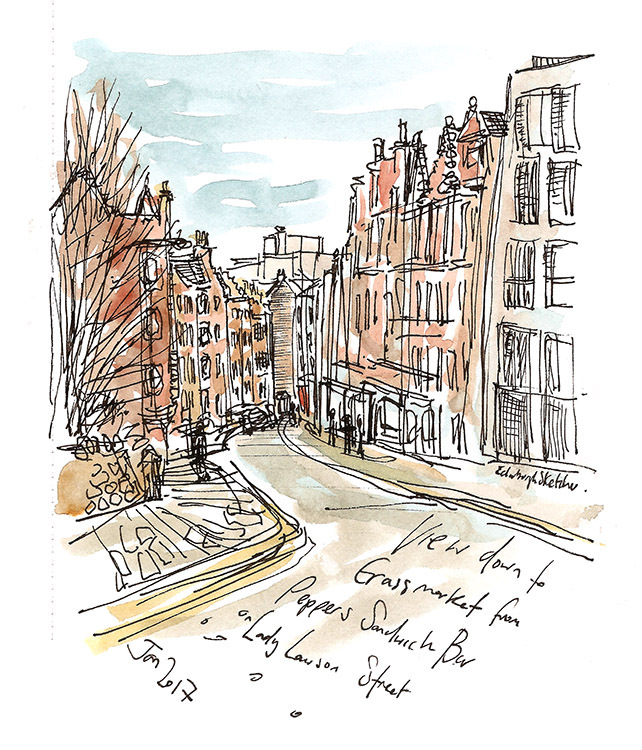 As 2017 gets started for me I have been in various locations around Edinburgh meeting people and sketching in the glorious sunshine we have been enjoying. 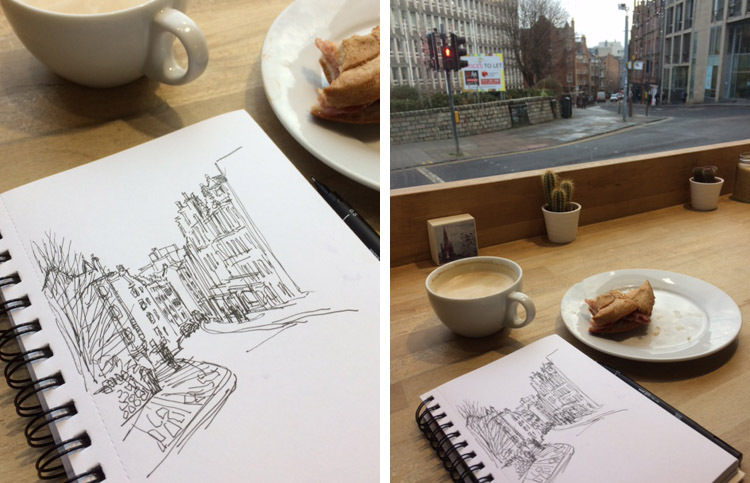 Whilst on route to meetings I have grabbed a quick 10 minutes to sketch my surroundings as Edinburgh’s beautiful vistas grab my attention. Some which I haven’t seen before, such as this one below from Morrisos Street shows the old Caledonian Distillery, which has been converted to residential buildings. The 300 feet tall chimney stalk was preserved – and is amongst the biggest of Victorian chimneys surviving in Scotland. The distillery is currently available to see as the ground in between has been cleared temporarily to create space for the new ‘The Haymarket Edinburgh’, a new office, retail and leisure space in the West End set for completion in 2018. The main sketch at the top of the page is from a new find for me, a sandwich bar offering delicious coffee and gluten free rolls, which made for a scrummy bacon roll this morning. Peppers Sandwich Bar is on Lady Lawson Street and the friendly staff and visitors alike enjoy this lovely view down the West Port towards the Grassmarket.